This post is for you Loa Angeles locals. But I'm starting to like the quality and the look of Z Gallerie products more and more. Actually the blog La La Linen wrote about some of her favorite summer Z Gallerie seashell and linen products in a post a few weeks ago here. 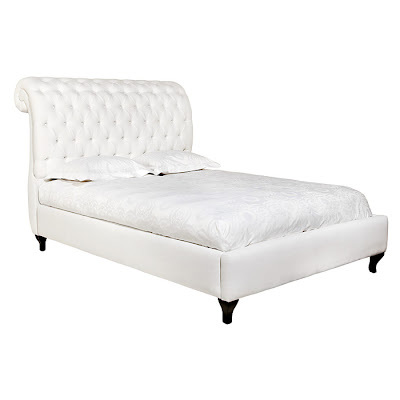 One of her favorite include the Ella Bed which would look wonderful in a little girl's room with some bright bedding. Many of our guest "real" nursery contributors have also purchased dressers and bed from Z Gallerie for their nurseries. So when my friend Ashley told me about this Z Gallerie Outlet in Gardena I had to go with her to take a look. The warehouse is close to Manhattan Beach (about a 15 minute drive) and is very easy to get to, just up Manhattan Beach Blvd. Almost everything in the outlet is 70% off. I will warn you though, some pieces are pretty beat up while others look brand new. They have dressers, buffets, side tables, beds, couches, chairs, coffee tables, lamps, artwork and desks. I think it is a perfect place to find a dresser, side table or couch for a playroom child's room that might get some occasional dings in it anyways. If you are within a 20 minute drive (especially if you live in the South Bay of Los Angeles), I suggest stopping by every few weeks to check out inventory. But really since the inventory sometimes completely turns over every day, if you need something asap, stop by every day for a week and you are bound to find something. Another helpful hint is that items cannot be held and have to be picked up the same day that they are purchased. Oh I will have to check this out the next time I am across town! Oh wow, I must check this out! I live in Culver City, so that's not too far. Thanks for the tip! I'm actually looking for a bookcase for my daughter's room, so I'll keep this in mind. Great find... Sometimes going to outlets actually allows you to find styles that you maybe wouldn't have expected. I know of a few interior designers that frequent shops like this just to keep a unique perspective.